Our Stacker 4 fat burner has been a household name in Europe for 15 years. It’s known as the continent’s best-selling fat burner! This popularity was achieved simply by delivering the best results. Stacker 4 increases your metabolism drastically and forces your body to use your fat reserves as a source of energy to burn this fat. Stacker 4 has a very sophisticated composition aimed at losing surplus pounds, and at the same time it provides a huge energy boost, keeping you sharp and alert. Stacker 4 is one of the most powerful weight-loss products to be invented and is a true gem! Stacker 4 is the strongest and best-selling fat burner in all of Europe! Stacker 4 is manufactured to not waste any muscle while you’re losing weight; it only burns fat and nothing else! One of the best-selling fat burners in Europe for many years! Is Stacker 4 the strongest fat burner in your product range? Yes, Stacker 4 is the best and strongest Stacker product currently available. It has been one of the best-selling fat burners in Europe for many years. Its enormous popularity is due to it being a combination of fat burner, energy booster and appetite suppressant. This is also one of the best priced fat burners. How come? Stacker 4’s popularity makes it possible to purchase raw materials in large quantities. Besides that, we have set a very fair selling price because the fight against excess weight should be affordable for everyone. Are there any products I can combine with Stacker 4 to lose weight even faster (in a healthy way)? Yes, Stacker 4 can be combined well with other supplements. Please note the second product you use is free of stimulants. One good combination is our Black Burn STIM-free (based on fish-oil). Other combinations are weight loss creams or high-protein meal replacements. 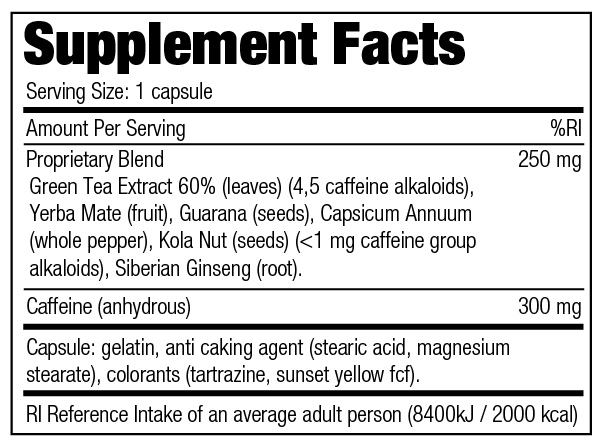 I am sensitive to high doses of caffeine, but still looking for a powerful weight loss formula. What is your suggestion? If you are sensitive to high doses of stimulants, then it might be better to opt for Black Burn STIM-free, or Black Burn Micronized. Black Burn Micronized is in powder form, which makes it easier to measure out your preferred amount. Of course, Stacker 4 is also effective even if you take just 2 capsules per day. Do bear in mind that it will then take longer to reach your target weight. Does this product have side effects? If so, what are they and how should I deal with them?? Should you be afraid of possible side effects, then it would be wise to increase the dose slowly. In this case, we suggest you to start with 1 capsule on the first day and then take 2 capsules on the second day. On the third day you can take the most effective dose of 3 capsules in order to support maximum fat burning. Side effects can sometimes occur and are due to a (severe) reaction of the body to the stimulants (such as nervous agitation, faster heartbeat or nausea). In the event of side effects, we recommend limiting the number of capsules per day to a maximum of 2 capsules. Of course, it also helps to avoid caffeine-rich products such as coffee and/or energy drinks. Fantastic resource. It gives you a boost all day long, and work-outs go great. No side-effects at all, even with the maximum prescribed dose. Top class. This is basically a more powerful version of Stacker 2. Beware, it has 300mg of caffeine, which might be too much for some. It is fine for me; I am a big guy and somewhere around 250-300 mg of caffeine is perfect. It gives a nice kick and provides a sharp focus. I like it a lot, especially at such an affordable price. Highly recommended, but remember, it is very powerful. I’ve been using the pills for 2 weeks and have lost almost 4 kilos. Now I am doing an extra half hour’s sports training every day. It’s also important to eat well (healthy food of course) and then take the pill, as advised on the jar. Next week I’ll start taking two pills per day. I’m really satisfied with the pills. They really are an aid, so don’t expect any effect if you just stay sitting on the bench.